It's annoying to cook for my family, and the other night's dinner illustrates why. My husband is happy with any dinner that involves meat -- as long as the meat does not have a glaze or sauce that's the slightest bit sweet. He eats a handful of different vegetables, but prefers that they are not mixed in with the meat. My older son doesn't like pieces of meat, but meat is ok if it's mixed in with other things. He likes ethnic food, particularly Asian and Mexican, as well as salads and every kind of olive. My younger son will not eat a single veggie (but he eats a lot of fruits). He will eat chicken prepared in any manner, as long as he can douse it in hot sauce. But no meats, unless it's unhealthy processed stuff. He loves potatoes in any form. And most cheeses, especially feta. I will not cook more than one meal, and I will not turn dinner into a battle. So I have a few options. I do a lot of "make your own" meals -- wraps, sandwiches, tacos, and pizzas. Option two is to make a meat main dish with a crazy bunch of side dishes. That's what I did the other night -- my mom's recipe for pork tenderloin, which is one of my husband's favorites. Baked potatoes for my husband and one son. Applesauce for my husband and the other son. Steamed veggies, which only I ate (older son had eaten the same veggies in a stir-fry the night before, but balked at eating them plain). And a salad for me and one son. ARRGGGHHH. So now you know why the dinner-type recipes I post on this site don't tend to be all that exciting. Anyway, here's that pork tenderloin recipe. It's good, but not for someone on a low-salt diet. Mix together all of the ingredients except for the pork. Put the marinade in a glass baking dish, add the pork tenderloins, and marinate overnight. Take pork out of marinade. Cook at 350 degrees approximately 1 hour. Boil the marinade in a pan for a few minutes. To serve, slice the pork on the diagonal. 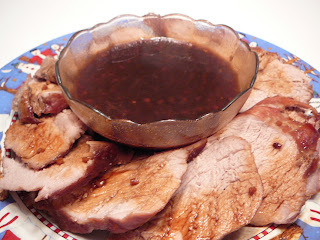 Drizzle a little sauce over the sliced pork. Serve with the sauce. The sauce also is good on steamed veggies. Camilla Saulsbury is a big name in the arena of cooking contests. She won two of the biggest national competitions -- National Chicken ($100,000 prize) and Build a Better Burger ($50,000) -- and has won money in scads of others. And now she has a lovely blog called Enlightened Cooking that focuses on healthy food. I thought I'd try one of the first recipes she posted, Cinnamon-Spiced Butternut Bread. I made it as she directed but used canned pumpkin instead of butternut squash (one of her suggested variations). Instead of her two large loaves, I made four small loaves. She suggested a few variations, and I did one of my own -- using mini chocolate chips in two of them. As I expected, it was delicious -- very moist and a little less sweet than some of the other pumpkin breads I've tried. If you want the directions for baking regular-size loaves, be sure to go to Camilla's recipe. Preheat oven to 350°. Spray 4 mini loaf pans with Baker's Joy (or another nonstick baking spray with flour); set aside. In a large bowl whisk the flour, sugar, brown sugar, baking soda, cinnamon, baking powder, salt, cloves and nutmeg; make a well in center of mixture. In a medium bowl whisk the oil, eggs, thawed squash and buttermilk until smooth. Add squash mixture to flour mixture, stirring just until moist. If desired, fold in dried fruit or nuts. Spoon batter into prepared pans, smoothing tops. 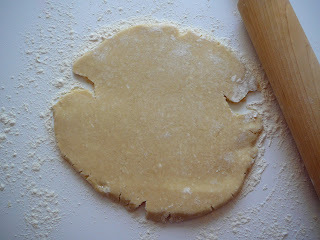 Bake 45-50 minutes or until a wooden pick inserted in center comes out clean. Cool loaves in pans 10 minutes on a wire rack; remove loaves from pans and cool completely on wire rack. Makes 4 mini loaves. Have you been noticing this logo on foodie bogs? Well, I had been for a few months. Finally I was curious enough to find out what it meant. I found out it's a group of bloggers (and some non-bloggers) who take on baking challenges as a group, with the idea of improving their baking skills. Each month a different challenge is posted, and if you're a Daring Baker you're expected to complete all (or most) of them and post on a given day. I liked the idea. It reminds me of my former book groups. When I was in a book group, the books I read were more challenging and varied that what I'd read on my own. Sometimes I'd groan about a particular book, but in the end, I'd learn something new or gain a new perspective. I figured the Daring Bakers experience would be similar. So I signed up in late December and awaited the January challenge with some trepidation. Finally it was announced: Lemon Meringue Pie! 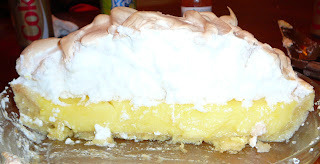 My husband was thrilled, because lemon meringue is his favorite pie -- a fact I did not know until I told him about the challenge. I haven't made many pies because they are not my thing (they generally don't contain enough chocolate to suit me). In the rare occasions when I have made pies, I have usually used refrigerated Pillsbury crusts, which honestly, I think are pretty good. I thought I'd tell you about the challenge from beginning to end. 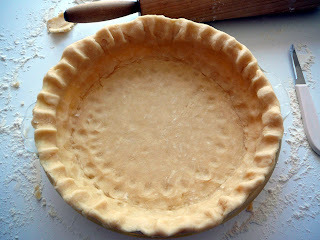 First, the pie crust. I used my food processor to combine butter and dry ingredients until it resembles "coarse meal." I'm never quite sure when this stage is done. Mine looked like this. I sprinkled with ice water, let it rest, then was supposed to process "very briefly," just until the dough begins to stick together and come away from the sides of the bowl. Well, by the time the dough was coming away from the sides of the bowl, it wasn't that brief of a spin. So maybe I messed up somewhere. But I forged ahead, making a disk and chilling it. When it was time to roll out the dough, I knew this was the step that can bring out my potty mouth. This one wasn't too bad. I had trouble with the sides splitting, but I found that rolling around the outside of the dough toward the cracks took care of that. I got the dough even and thin, and rolled it around the rolling pin to transfer it to the pie plate. I picked the rolling pin up by the handles, and the crust ROLLED OFF OF THE ROLLING PIN AND HEADED FOR THE FLOOR!!!! AHHHHH....... I half-moaned, half-yelled (to the amusement of my husband, who thought I was taking this all too seriously). I made a spectacular midair catche. Whew! Despite its perilous plunge, the dough made it into the pie plate in one piece. I'm not very good at crimping dough, but it looked ok. All in all, things looked promising. I lined the dough with foil and pie weights and baked as directed. After the blind baking, I took the crust out of the oven. When I removed the foil and pie weights, I was a bit concerned. The crust had shrunk down about 1/2 inch, and it seemed to be oozing butter. Although I wasn't convinced this was going to turn out well, I had people coming for dinner and this was dessert, so I put it in the oven to finish baking. Luckily, I didn't end up with a pancake-like crust. I've made lemon curd before, but this recipe was different because the lemon juice (a whopping 3/4 cup) was added at the end of the process. After it was done, the curd seemed a little thin, but the color was pretty. 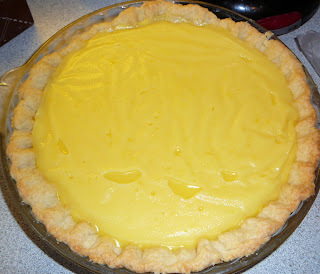 I knew that lemon curd thickens a bit as it cools, so I wasn't all that concerned. This recipe has you cool the lemon curd before putting the meringue on top - something that has a matter of debate among the Daring Bakers. The final step: the meringue topping. By this stage, my dinner guests had arrived, and in my haste to finish the pie, I'm pretty sure I messed this up. I put the egg whites in the bowl and turned on my KitchenAid mixer to full blast, until they held stiff peaks. Then, when I checked the recipe as I was adding the sugar, I realized I was supposed to FIRST beat the whites until they hold soft peaks, THEN get stiff peaks after adding the sugar. Oopsies. 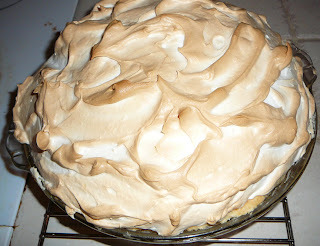 It made a huge mound of meringue and as my dinner guests looked on, I piled it on the pie and did a few random swirls. I popped the baby in the oven to brown the meringue and thought it came out looking reasonably nice. As I cut into the pie, the meringue sort of disintegrated. I don't think I've ever eaten a pie with a meringue topping, but I imagine it's supposed to be a bit more creamy. And the meringue didn't seem to stick to the lemon curd very well. Even still, all of the dinner guests finished their pieces of pie and said they enjoyed it. One friend said he especially liked the crust. I did, too, because it had a shortbread flavor. The lemon filling was just thick enough to hold its shape and was very tart -- maybe a tad too tart for me. And the meringue probably would have been good if I had done it right. Later that night, after the guests had left, I found my husband parked in front of the TV, pie plate in front of him, happily consuming the remainder of the pie. That made all my effort worth it. Now that I've tackled Lemon Meringue Pie once, I'll probably try it again, but with a different recipe (there's one that looks promising in this month's issue of Gourmet). So I'm going to call my first Daring Bakers challenge a success. And now I'm waiting -- with a equal parts trepidation and excitement -- about what challenge awaits me next month. I know from some family members' experiences that grocery store chains can be lousy places to work. In contrast, Wegmans was ranked #3 on this year's list of “100 Best Companies to Work For” in Fortune Magazine, and it has appeared on the list every year since it was first published in 1998. As a customer, I'm glad to shop at a store that treats their employees well. I wish other retailers would learn from their example. 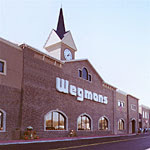 Wegmans also treats their customers well, with pleasant stores, competitive prices and good service. I'm proud of our Rochester-based grocery store chain! I'm still on my New Year's quest to eat healthier/lose weight, and this is the latest breakfast recipe I've tried. 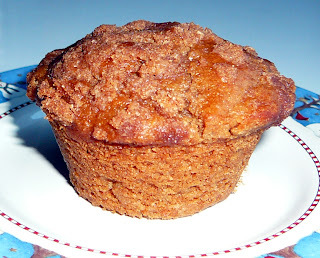 These Sour Cream Coffeecake Muffins were moist and tender, and swirled with cinnamon-y goodness. In fact, they are almost too good. I can polish one off in four bites and could easily eat three muffins in a sitting. At around 180 calories each, that would be like making a trip to Dunkin' Donuts! I also found it hard to stay away from them during the day. But one of these with a banana is a satisfying and enjoyable way to start the day. Next time I make them, I'll probably freeze them and take out a few at a time so there's less of a temptation to indulge in too many. Combine first dark brown sugar, pecans and cinnamon. Set aside. 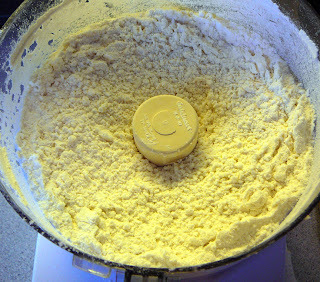 Place granulated sugar and butter in a large bowl; beat with a mixer at medium speed until well blended (about 3 minutes). Add egg; beat 3 minutes. Beat in sour cream, water, and vanilla. Lightly spoon flour into dry measuring cups; level with a knife. Combine flour, baking powder, baking soda and salt in a large bowl, stirring well with a whisk. Make a well in center of mixture; add sour cream mixture. Stir just until combined. Place 3 Tablespoons brown sugar mixture in a small bowl; set aside. Sprinkle surface of batter with remaining brown sugar mixture. Gently fold batter 4 times. Place 18 paper muffin cup liners in muffin cups; coat liners with cooking spray. Spoon batter into prepared cups. Sprinkle batter evenly with reserved brown sugar mixture. Bake at 400 degrees for 18-20 minutes or until a wooden pick inserted in center comes out clean. Remove muffins from pan immediately; place on a wire rack. Cool 10 minutes. Combined powdered sugar and milk in a small bowl, stirring until smooth. 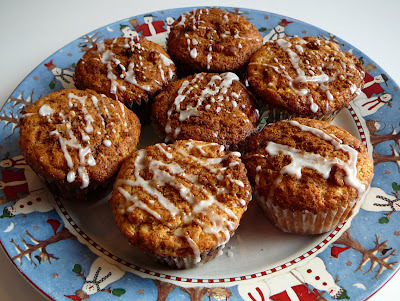 Drizzle powdered sugar mixture evenly over muffins. Makes 18 muffins. Roughly 182 calories and 5.7 grams of fat per muffin. What's For Dinner Honey, a food blog out of Germany, is hosting a blog roundup with the theme of comfort foods. She says these foods are simple, no frills and easy to prepare. If so, this soup totally fits the bill. It comes together in about an hour, and is just the right weeknight meal for the cold days we've been having. I got the recipe on the Cooking Light Great Food bulletin board, which is a congenial group and a great source of recipes and cooking tips. Another great source of recipes is food blog events, so be sure to check out What's for Dinner Honey in early February for more comfort food recipes (unfortunately the cold weather will probably still be going strong then). In a Dutch oven over medium heat, combine meat, onion, and garlic and cook, breaking up meat with a spoon, until it's no longer pink, about five minutes. Add remaining ingredients and bring to a boil. 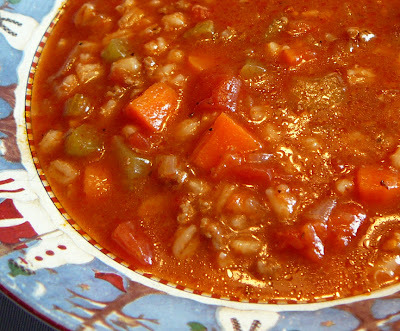 Reduce heat to medium-low and cook, covered, until vegetables and barley are tender, about one hour. Discard bay leaf. This can be made ahead to let the flavors develop. It will thicken if you make it ahead. Lasagna Throwdown: Bobby vs. Tom's favorite! When we finally took a road trip there, I thought Burlington was charming, but I was surprised to see the restaurant after all of Tom's rave reviews. It was small and its decor was plain and unpretentious. But the food is what's important and the lasagna was excellent. They sell their sauce in jars now, and I buy it on special occasions (because it's pricey and hard to find). Tom swears it tastes just like the stuff they serve in the restaurant. So onto the Throwdown, which we Tivo'd and watched together last night. I'm always interested in seeing how people take the surprise and the challenge. Some of them take it waaaayyyy too seriously. Come on, folks. You are getting national exposure for your place of business, and the Food Network wouldn't be there if the food wasn't good. Bobby ALWAYS tastes and compliments the competitor's food. It's all in good fun. Anyone who gets his britches in a knot gets a thumbs down from me. When Mark Bove saw Bobby Flay, he was so excited and honored to have Bobby there for a Throwdown, I thought he was going to cry. That's the spirit, Mark. Bobby, true to form, made an untraditional lasagna (although surprisingly I didn't notice any poblano or chipotle chiles go into it). It had pork shank and beef shank and, frankly, looked divine, in a different way that the Bove's lasagna looked divine. 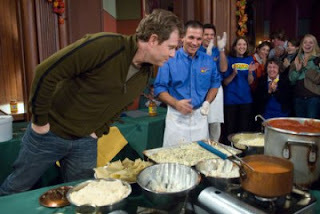 When the voting was done, the judges complimented both lasagnas, and picked Bobby Flay's. 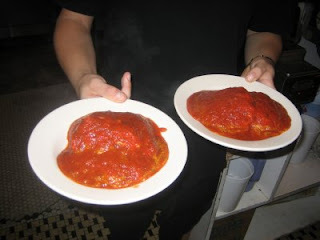 They did say they liked the sauce on the Bove's lasagna better. Mark Bove was a good sport about it, but Tom was disappointed. I thought it was like comparing apples and oranges, and those two judges happened to like oranges. At any rate, if you happen to be in Burlington, we highly recommend Bove's, particularly on lasagna night, which I believe is Wednesday. 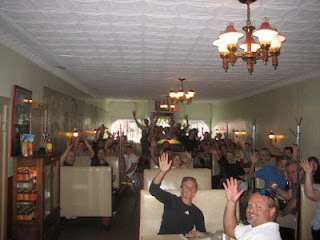 Here's a link to the Bove's Web site, which curiously doesn't have a lot of info about the restaurant. If you'd rather make the recipes at home, here are links to the Bobby Flay recipe and the Bove's recipe. If I can find the Bove's sauce and meatballs called for in the recipe, I may have to try making the Bove's lasagna for Valentine's Day. I had six black bananas on my counter, so I made a double batch of Jamaican Banana Bread and kept one for our house and took the other to band practice. I've never made this recipe before, but it has received rave reviews on the Cooking Light Web site and bulletin board. I made it as written except for substituting King Arthur white whole wheat flour for half of the all-purpose flour. It was really good. I loved the combination of the tangy lime with the sweet banana. It was a welcome taste of the tropics in the middle of our cold snap. Of course it would be even yummier if I doubled the tangy topping but then I suppose it wouldn't be light. I might like it a bit moister, so next time I make it, I might add just a little more banana. I frequent the Cooking Light Great Food bulletin board, and we've had debates about how we like recipes written. I don't think there's a right or wrong way, but I personally like each ingredient to appear once in the recipe. It helps me when I'm making sure I have enough of each ingredient. If it's used twice in the recipe it should indicate as much in the list of ingredients (with "divided use" as an example) so that you don't dump in the entire amount the first time you use it. This recipe is a good example of why I like the ingredients to be listed once. Toasted pecans are called for twice in the list of ingredients. I didn't notice, so I had to toast pecans two separate times -- not a huge deal but a tad annoying. I also don't like it when a recipe says add "the next five ingredients," which Cooking Light always does. So for my own use, and yours if you like it written my way, I've rewritten the recipe below. If you like written it their way, just go to the recipe on the Cooking Light site. Prep: Soften butter and cream cheese. Toast pecans. Juice lime. Mash bananas. Preheat oven to 375F. Coat an 8 x 4-inch loaf pan with cooking spray; set aside. Beat 2 tablespoons margarine and cheese at medium speed of a mixer; add 1 cup sugar, beating well. Add egg; beat well. Combine flour, baking powder, baking soda, and salt; stir well. In another bowl, combine banana, skim milk, 1/4 teaspoon rum extract, lime rind, 2 teaspoons lime juice, and vanilla extract; stir well. Add flour mixture to creamed butter mixture alternately with banana mixture, beginning and ending with flour mixture; mix after each addition. Stir in 1/4 cup pecans and 1/4 cup coconut. Pour batter into prepared pan; bake at 375F for 50 to 60 minutes or until toothpick inserted in center comes out clean. Let cool in pan 10 minutes; remove from pan. Let cool slightly on a wire rack. Combine brown sugar and 2 teaspoons each butter and lime juice, and 1/8 tsp rum extract in a saucepan; bring to a simmer. Cook 1 minute; stir constantly. Remove from heat. 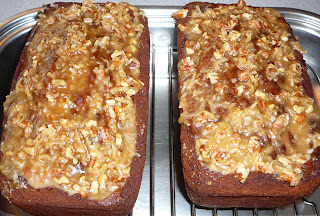 Stir in 2 tablespoons each pecans and coconut; spoon over loaf. Anna tagged me for a meme. Why not. I kinda like writing and reading them. At that time, I was a stay-at-home mom of a baby and a 3-year-old. That was pretty much all-consuming. I was diligently practicing the guitar and learning lots of songs for our newly formed band, CRB. 1. (Obviously) provide for the futures of my kids, niece and nephews. 2. Buy the Buffalo Bills and keep them in Buffalo. Do whatever it took to get them to win a Super Bowl. I’d do it as a gift to my wonderful husband and his hometown. That would probably blow most of the billion. 3, 4, 5 Contribute to curing diseases that have afflicted friends & family. 2. Spending waaaayyy to much time on the computer. 3. Doing the laundry, but procrastinating of the steps of folding and putting it away. 4. Not putting on makeup in the morning. 5. Biting off more than I can chew (I mean that figuratively, not literally). 1. Bake, alone in my kitchen, with my tunes cranked. 2. Make music with other people. 4. Go to concerts and plays. So the deal is that I'm supposed to "tag" people. I'm a little stuck on this one and will come back to it. Any volunteers? I have a short list of foods that I don't like but wish I did. The list includes winter squash -- butternut, acorn, etc. I get them in my Porter Farms CSA bag, and can get lots for free at the end of the season at Wickham Farms. They are nutritious and great at this time of year, when produce is sooo expensive and not that good. Every year I try new squash recipes, but the results rarely appeal to me. We recently had friends (M&M) over for dinner. M (the wife) is a former farm girl from Michigan and eats most veggies, so I thought I'd experiment with some butternut squash still in the fridge from Porter Farms. The family doesn't like things that are spicy or ethnic, so I made this basic butternut squash soup from Cooks Illustrated. (The only change I made was to use less butter.) The preparation is unusual but easy. 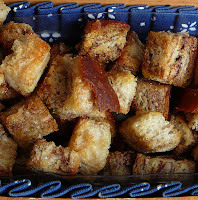 One of the suggested garnishes was cinnamon-sugar croutons, and I did my own spin on them using some cinnamon bread I had in the house. 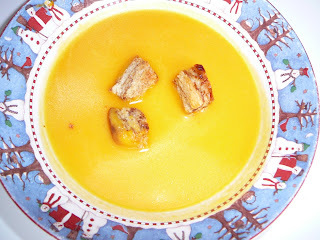 I didn't think I'd like the sweet croutons in the soup, but the combination rocked. Even M (the husband) ate a bowl -- and his wife commented that he doesn't usually like butternut squash. I'm sending this to Sweetnicks for her ARF/5-A-Day roundup. If you (like me) are looking for healthy recipes for your new year's diet, that's a good post to check out on Tuesdays. Heat butter in large dutch oven or a pot that comes with a removable pasta insert. (I used the latter.) Add shallots and cook, stirring frequently, until softened and translucent, about 3 minutes. Add squash scrapings and seeds and cook, stirring occasionally, until fragrant and butter turns bright yellow, about 4 minutes. Add 6 cups of water and 1 1/2 teaspoons salt and bring to a boil over high heat. Reduce heat to medium low, place squash cut-side down into a steamer basket (or pasta insert, which is what I used), and lower the basket into the pot. Cover and steam until squash is completely tender, about 30 minutes. Remove from heat. Use tongs to transfer squash to rimmed baking sheet; reserve steaming liquid and the stuff in it. When cool enough to handle, use a large spoon to scrape the yellow flesh from the skin into a bowl; discard skin. Pour the reserved steaming liquid through a mesh strainer into a second bowl. Discard the stuff that's in the strainer. Rinse and dry the cooking pot. In a blender, puree the squash and reserved liquid in batches, pulsing on low until smooth. (Do not overfill the blender or it will overflow. To be on the safe side, cover it with a towel while you are blending.) Transfer the puree back to the cooking pot; stir in the cream and brown sugar. Heat over medium-low heat until hot. Add salt to taste. Serve immediately. (I made it ahead and it reheated fine.) Makes 1 1/2 quarts, serves 4-6. Preheat oven to 350 degrees. Put butter on a rimmed baking sheet and put in oven until the butter melts. Remove from oven. Put bread on the melted butter and toss until all are coated with butter. Bake until crunchy, about 10 minutes. 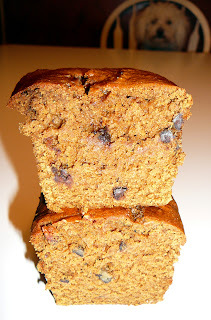 I am always on the lookout for good recipes for using up overripe bananas. 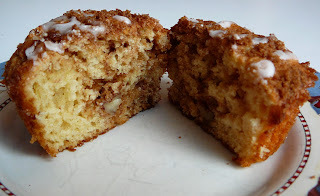 Even though I frequently try new recipes, I keep coming back to this recipe for Banana Nut Coffee Cake with Caramel Icing. I've made it several times and people rave about it. It's a moist cake with a ribbon of cinnamon and nuts, topped with a thick layer of caramel frosting. The generous amount of frosting might be too much for some people, but I love it. An impulse purchase at Target made the recipe even better. I found cute mini fluted tube pans, sold in packs of two for less than $5, and used them to make mini cakes that I gave to neighbors as holiday treats. I wasn't sure how many mini cakes to make from one recipe, so I guessed at five. I think the shape would be nicer, and the serving size more reasonable (I figure that one mini cake is two servings) if I made six. I liked the mini cakes so much that I may never go back to making one big cake (which is shown below). Preheat the oven to 350. 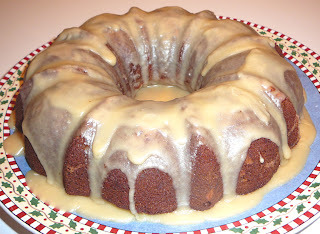 Spray a Bundt pan with Bakers Secret and set aside. Combine pecans and cinnamon sugar; set aside. With a mixer, cream shortening and sugar together until light and fluffy. Beat in the eggs, banana and vanilla. Add the sour cream and mix until blended. Sift together the flour, baking powder, baking soda and salt. Add to the batter and beat until blended. Sprinkle half of the sugar/nut mixture into the greased pan. Top with half of the cake batter. Follow with the second half of the sugar/nut mixture and end with the rest of the batter. Bake for 35-45 minutes or until a toothpick comes out clean. Cool 5 minutes in the pan, then turn out the cake to finish cooling. 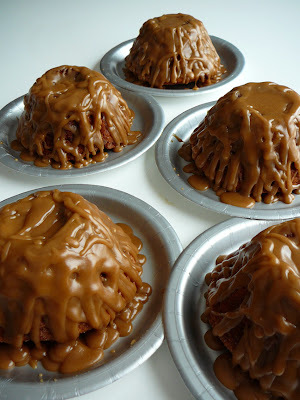 If desired, drizzle with caramel icing. Melt the butter in a saucepan. Add the sugar and the milk. Bring to a boil and continue to boil for 1 minute (it's in bold because I often forget this part). Remove from the heat, add the vanilla and gradually mix in the powdered sugar. Let cool until slightly thickened and drizzle over cake. If too much runs off the cake, wait a few minutes before drizzling again. If it hardens up too quickly, add some more milk to thin it out. The excitement leading up to the Pillsbury Bake-off contest is starting! As I mentioned before, I am one of two Rochester-area finalists in this year's contest. Yesterday morning we both had an interview with Norma Holland at WHAM News. She and the rest of the WHAM staff were quite pleasant, even though we happened to be in the newsroom on an unusually frantic day. Rochester was having winds of up to 75 miles an hour, causing downed trees, power outages, closed schools, and so on. In fact, when I woke up, I was really nervous about driving in the crazy wind and rain -- I literally didn't know if I could control the car. I poked my sleeping husband and told him that I was worried about driving in this weather. He opened one eye. "You'll be fine," he muttered, and rolled over and went back to sleep. Irritating. But he was right -- I was fine. 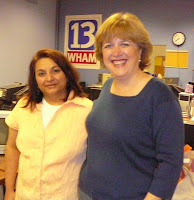 When I arrived at the studio, a WHAM staff member took me to the newsroom. It was quiet and mostly empty, other than three three women answering phones and sharing notes about the weather. A few minutes later, I was joined by Vanda (pronounced Wanda), the other Rochester-area finalist. She and I hung out in the newsroom and chatted. 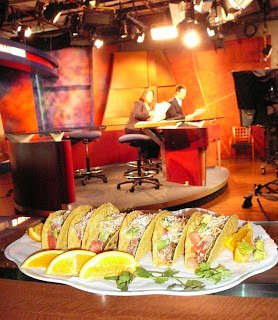 While we were waiting, Vanda plated her tacos, nicely garnishing them with orange slices and parsley. Finally, we were called into the studio. When we got there, two men were wheeling around large parts of the set to arrange for our interviews. Vanda's interview was first, at 7:45. 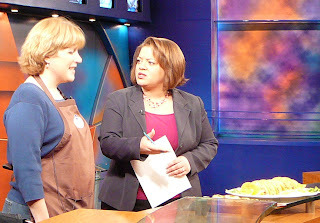 She talked about her Mexican Pesto-Pork Tacos, which she told Norma she submitted to the contest without having cooked first. I've heard of people doing that but I don't have that kind of talent. Norma: Is anyone watching American Gladiators? I'm obsessed with that show. Me: My 10-year-old son is crazy about that show. That's a talent in my book. I can't tell you the number of times I'll start a story, go off on some tangent, and then draw a complete blank about what I was originally talking about. I liked Norma. I could hang out with her. 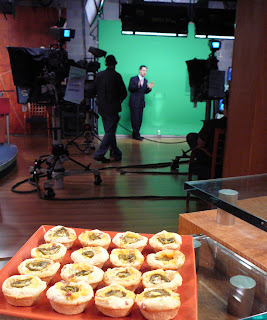 At 8:40, it was time for my interview about my Jalapeno Popper Cups (the video doesn't appear to be on their Web site any more). For me, TV interviews are like an out-of-body experience. My mouth is moving and coherent words are coming out, but my brain is thinking unrelated things like "I look old and pale in that monitor ... I should have worn more makeup ... I look fat too .... I can't be that fat, can I? ... I wonder if I change the way I'm standing I'll look thinner ... nope, that didn't help ... I wonder if I should be looking at Norma or at the camera ..." And in a few minutes, the interview is over and I couldn't tell you a single thing I said. 1. Check out the 100 Finalists Recipes. 2. Vote for your favorite recipe. The recipe that gets the most votes is declared "America's Favorite Recipe" and the creator win $5,000! If course, I'd be thrilled if you'd vote for my recipe, but I should mention that you really do want to like the recipe you vote for. By voting for your favorite recipe, you are entered into a sweepstakes. One voter will be randomly drawn, and if that voter picked the recipe that received the Grand Prize at the Bake-Off® Contest finals, that voter will also win $1 million! (If not, they get a $500 coupon for GE Appliances.) So vote for your favorite recipe today! 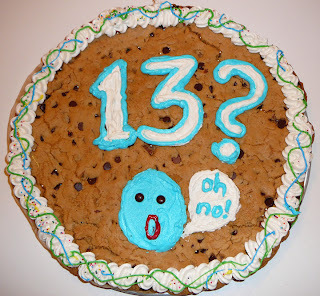 Cookie cake for my TEENAGER! As of this week, I am the mother of a TEENAGER. Ack! I asked my son what kind of cake he wanted for his birthday, and he told me a chocolate chip cookie cake (a simple request compared to last summer's birthday baking project). He didn't tell me how he wanted it decorated, so I did my own thing -- projecting how I felt about having a teenager. I thought it was kind of amusing. My 13-year-old, whose birthday has been accompanied by his first real pimple, interpreted the decorations a different way. 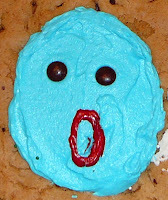 The blue guy had some errant sprinkles on his face, which my son thought was meant to be pimples. He thought the guy was saying "oh no" about having pimples. Oops. Nothing like a mom's insensitivity to ruin a kid's self-esteem. Oh well ... I have my own self esteem to worry about. I've been a little dejected about the idea of being the mother of a teenager. Luckily, tonight CRB has a fun gig at the Jukebox in Spencerport. There's nothing like some rock & roll to make you feel young! Any Rochesterians out there, come out and see us! We'll take the stage sometime between 10 and 11 p.m. There's no cover. Rah Cha Chow note: This is my favorite dough for making chocolate chip cookies. If you are making a cookie cake, it will be a bit too much dough for a 12-inch pizza pan. Either eat the extra dough with a spoon (don't blame me if the raw eggs make you sick) or make a few cookies with it. Heat oven to 325 degrees. Mix flour, salt and baking soda in a medium bowl; set aside. For the cookie cake, press most of the dough onto a 12-inch parchment-lined round pizza pan, leaving a one-inch rim on the outside rim of the pan. Bake until light golden brown, about 21 minutes. With the extra dough, drop by scant 1/4 cups onto baking sheet. Place on parchment-lined cookie sheets. Bake until cookies are light golden brown and outer edges start to harden yet centers are still soft and puffy, 15 to 18 minutes. Cool cookies on cookie sheets. Place shortening in a large mixing bowl. Add two cups confectioners sugar and then the milk and the vanilla. On the medium speed of an electric mixer, beat until smooth and creamy, about 3 to 5 minutes. Add one more cup of sugar and beat for two minutes. If you want the icing thicker, add the remaining cup, a little at a time, beating well after each addition. You may not use the whole cup. 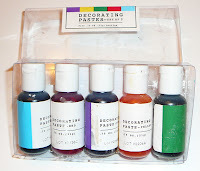 If desired, add a few drops of food coloring paste and mix thoroughly. Use and store the icing at room temperature for up to three days. This makes plenty for making various colors to decorate the cookie cake. You will have some left over. Yesterday I made Quiche Lorraine for a friend. I had a lot of the ingredients (heavy cream, whole milk, Swiss cheese) left over from my holiday cooking, so I used them up. But since I'm on my healthy new year's kick, I lightened it up by using turkey bacon. Every little bit counts, right? I think making a pie crust is a pain, and the refrigerated Pillsbury crusts are pretty good, so that's what I usually use. I know that's not what "real" cooks do. So sue me. While the crust is baking, cook bacon as desired. (I cook regular bacon in the microwave, about 1 minute per slice. Turkey bacon needs to be cooked in a frying pan). Cool slightly and cut or rip it into 1/2-inch pieces. In a medium bowl, whisk together eggs, yolks, cream, salt, pepper and nutmeg. Distribute cheese and bacon evenly over the bottom of the warm pie crust. Pour in egg mixture to about 1/2 inch below top of crust (you may not use every bit of it). 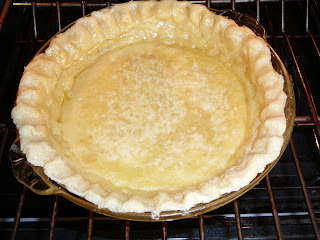 Bake until lightly golden brown and a knife blade inserted about one inch from the edge comes out clean, and center feels set but soft like gelatin, 32 to 35 minutes. Transfer quiche to rack to cool, at least 10 minutes. Serve warm or at room temperature. To freeze, cook as directed, cool, cover with two layers of foil, and freeze. Thaw in the refrigerator, then heat to serve. This makes one quiche. The original recipe says it serves 8. With me and my friends, it serves four. For Leek and Goat Cheese Quiche: Saute white parts of 2 medium leeks, washed thoroughly and cut into 1/2 inch pieces (about 2 cups) in 2 tablespoons unsalted butter until soft, 5-7 minutes. 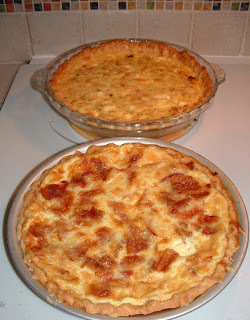 Follow recipe for Quiche Lorraine, but reduce milk and cream to 3/4 cup each. Omit bacon; add sauteed leeks instead. Use 4 ounces mild goat cheese, crumbled, instead of Gruyere or Swiss. If you're like me, and starting the New Year with a goal of eating healthier, here's a recipe for a relatively healthy muffin. I got it from the Cooking Light Great Food bulletin board, one of my online hangouts. I'm not going to lie and say they are as tasty as, say, a full-fat chocolate chip muffin, but they are pretty good. Preheat oven to 400 degrees. Coat 12 muffin cups with cooking spray. To prepare struesel: Mix brown sugar, whole-wheat flour and cinnamon in a small bowl. With a pastry blender or your fingers, cut in butter until the mixture resembles coarse crumbs. Stir in walnuts, if using. Set aside. Whisk egg and brown sugar in a medium bowl until smooth. Whisk in apple butter, syrup, cider, yogurt and oil. Add to the dry ingredients and mix with a rubber spatula just until moistened, Scoop the batter into the prepared muffin cups (they will be quite full). Sprinkle with the struesel. Happy New Year! My New Year's Eve was one of the best I can remember -- good music, good food, good friends. We're going to spend the day watching the Winter Classic (an outdoor Sabres hockey game) on TV and taking down Christmas decorations. The "Foodblogger's Recipe Collection Best of 2007" received 133 entries from around the world! It is divided into three posts, by country. Lots of great ideas ... plus it's interesting to see what people around the world are cooking. One Hot Stove hosted Best (Blogging) Moments of 2007. It includes lots of new (to me) food blogs that I'd plan to check out.